I’m so behind on the crackle/shatter polish trend (is it even a trend anymore?) I wasn’t totally sold on it when it was first making the rounds on blogs, but I’ve finally picked up my first crackle—and first Color Club polish—Tattered in Gold. 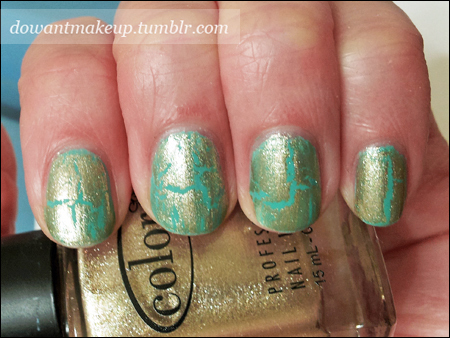 I was inspired by a sky blue/gold crackle combo I saw. Sadly, Tattered in Gold’s antiquey-gold shade doesn’t contrast enough with For Audrey’s turquoise to make it pop, so I’m a bit disappointed with the results. Next time I’ll pair it with something darker.